Great signature model in top condition! + + + Comes with Custom Shop case, certificate. (The videos are from another one I had in stock previously) + + + "Since its origin in 1949, the ES-175 has seen several variations with different pickup and hardware configurations. The wood, construction, and headstock pitch all contribute greatly to the tone, aiding this guitar's exceptional sustain and depth, and yielding a resonance that can be felt right through the body. + + + Product Specifications: Maple top and back with period correct one piece solid maple rims. Mahogany neck, tan bound rosewood board with nylon nut. Jim Dickinson Burst finish. Hollow body. MHS Humbucker pickups. V.O.S. nickel hardware. Kluson Single Ring tuners. Rolled neck binding. Vintage style "no logo" potentiometers. Quartered Adirondack Spruce braces. 45° bevel on plastics. 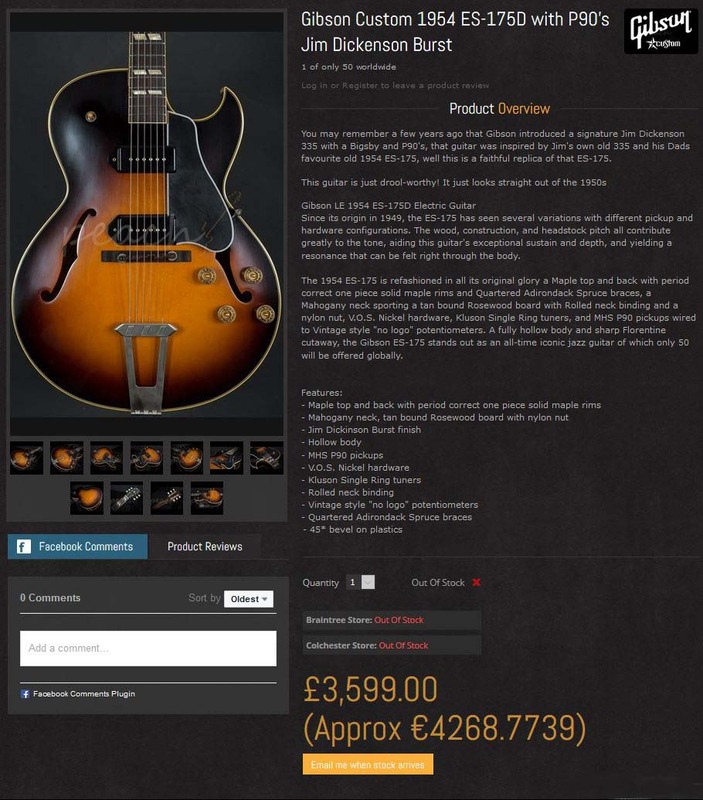 + + + Gibson Memphis LE 1954 ES 175D Hollow Body Guitar Specifications: Body Contour: ES-175 (Hollow). Top wood: 3-Ply vintage plain maple, poplar, maple. Top binding: tan. Back wood: 3-Ply vintage plain maple, poplar, maple. Back binding: tan. Rims wood: maple, poplar, maple. Weight relief: hollow body construction. Neck wood: 1-piece mahogany. Truss rod: Historic. Neck profile: soft "C". Thickness at 1st fret: .855". Thickness at 9th fret: 1.000". Peg head: SP-1. Peg head inlay: mother of pearl crown. Peg head binding: none. Peg head logo: mother of pearl "Gibson". Headstock angle: 17°. Fingerboard wood: 1-piece dark rosewood. Fingerboard radius: 12”. Frets: 19. Width at nut: 1.704". Width at end of board: 2.197". Scale: 24.75". Side dots color: tortoise shell. Inlays: split parallelogram. Nut material: nylon. Nut width: 1.704". Pickups: MHS P-90. Tuning keys: Kluson Single Ring tulip button. Bridge: Compensated top with rosewood base. Tailpiece: 3 diamond. Output jack: 1/4" jack. Pickguard: multi-ply black ES-175 with 45° bevel (V.O.S.). Truss rod cover: vintage (V.O.S.). Knobs: gold speed knobs (V.O.S.). Accessories: tan and pink period correct hard shell case." The 1954 ES-175 is refashioned in all its original glory a Maple top and back with period correct one piece solid maple rims and Quartered Adirondack Spruce braces, a Mahogany neck sporting a tan bound Rosewood board with Rolled neck binding and a nylon nut, V.O.S. Nickel hardware, Kluson Single Ring tuners, and MHS P90 pickups wired to Vintage style "no logo" potentiometers. A fully hollow body and sharp Florentine cutaway, the Gibson ES-175 stands out as an all-time iconic jazz guitar of which only 50 will be offered globally. Features: - Maple top and back with period correct one piece solid maple rims - Mahogany neck, tan bound Rosewood board with nylon nut - Jim Dickinson Burst finish - Hollow body - MHS P90 pickups - V.O.S. Nickel hardware - Kluson Single Ring tuners - Rolled neck binding - Vintage style "no logo" potentiometers - Quartered Adirondack Spruce braces - 45* bevel on plastics Product Specifications Gibson Memphis LE 1954 ES 175D Hollow Body Guitar Specifications Body Contour: ES-175 (Hollow) Top Wood: 3-Ply Vintage Plain Maple, Poplar, Maple Top Binding: Tan Back Wood: 3-Ply Vintage Plain Maple, Poplar, Maple Back Binding: Tan Rims Wood: Maple, Poplar, Maple Weight Relief: Hollow body construction Neck Wood: 1 Piece Mahogany Truss Rod: Historic Neck Profile: Soft "C" Thickness at 1st fret: .855" Thickness at 9th fret: 1.000" Peg Head: SP-1 Peg Head Inlay: Mother of Pearl Crown Peg Head Binding: None Peg Head Logo: Mother of Pearl "Gibson" Headstock Angle: 17 degrees Fingerboard Wood: 1 Piece Dark Rosewood Fingerboard Radius: 12” Frets: 19 Width at Nut: 1.704" Width at End of Board: 2.197" Scale: 24.75" Side Dots (Color): Tortoiseshell Inlays: Split Parallelogram Nut Material: Nylon Nut Width: 1.704" Pickups: MHS P-90 Tuning Keys: Kluson Single Ring Tulip Button Bridge: Compensated Top with Rosewood Base Tailpiece: 3 diamond Output Jack: 1/4" jack Pick Guard: Multi ply black ES-175 with 45° bevel (V.O.S.) Truss Rod Cover: Vintage (V.O.S.) Knobs: Gold Speed Knobs (V.O.S.) Accessories: Tan and Pink Period Correct Hard Shell Case"